I suppose my days of posting about Mad Men and Frank O’Hara are probably numbered, as the show’s final season begins this Sunday. But the media hype about the show’s final run is reaching a fever pitch, and the New York Times does not disappoint: a new article gives us another chance to think about the fortuitous intersection of the lauded program and O’Hara’s poetry. 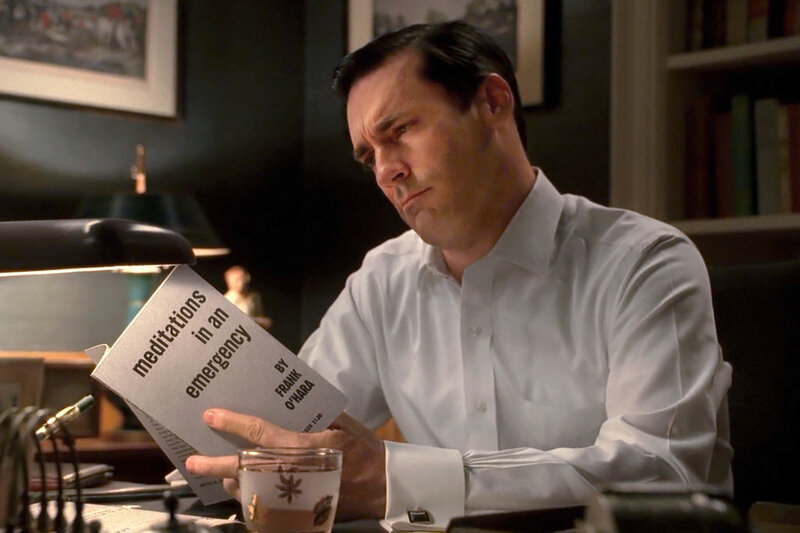 Among other cultural touchstones, such as “The Twilight Zone,” “The Twist,” and The Beatles at Shea Stadium, the feature includes a section on Frank O’Hara’s Meditations in an Emergency, which played a much-discussed role in Mad Men‘s second season, along with some interesting commentary by Matthew Weiner, the show’s creator, on how he ended up using O’Hara’s work. That was a magical occurrence. I had studied poetry in college, and I read a lot of poetry, but I did not know Frank O’Hara. My wife took me to an exhibit between the first two seasons at the Museum of the City of New York and they had individually printed pieces of paper where you could read some Frank O’Hara poems. So I had one of these folded up in my pocket and it led me to think that Don, who was experiencing boredom after recommitting himself to his family, runs into this guy who just says he’s a suit, he’s a button-down guy. In my mind, Don bought the book ‘Lunch Poems.’ But that had not come out yet, so we had to use Meditations in an Emergency. I read a little bit of it and said, we’ll use this. It has a great cover, it’s very period, it was definitely a popular book. We put it into the episode and then at the end, Kater Gordon, who was the writer’s assistant at the time, said, ‘Don’t you think he should read some of it? Don’t you think we should hear it?’ And I had not read the whole book. So I sat down and read that last poem, “Mayakovsky,” and I said ‘What? This is the story of the season!’ It was exactly related to how Don felt in that episode. I wish I could act like it was planned that way, but it wasn’t. So there you have it — if you’ve ever wondered why Mad Men had that hipster introducing Don to Frank O’Hara’s poetry, rather than to a much more predictable choice, like Allen Ginsberg’s, now you know that it was mostly the result of a “magical occurrence” — a mix of chance and good creative instincts on the part of Weiner and his staff. Although the 1967 review worries that gifted writers like O’Hara who die young are “likely to pass quickly into oblivion as public and publisher move on to new sensations,” I don’t think we need to worry about that happening in O’Hara’s case, as his famed cameo on Mad Men makes abundantly clear.